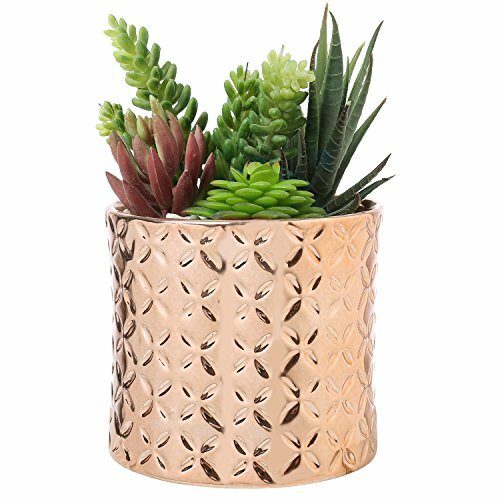 Uniquely modern and retro at the same time, this miniature 5-inch planter with a scintillating textured metallic copper finish provides a dazzling accent for small spaces, even when empty. This striking copper-toned canister makes a bold impression with a diamond-indented pattern to reflect light, and makes a perfect addition to mid-century and contemporary decors. The small size is ideal for windowsills, desktops, and shelves, while it's shiny copper color offers a unique pairing for earthy grasses or vibrant wildflower arrangements. Approximate Dimensions (in inches): 4.5 H × 4.9 Diameter. 5-inch miniature ceramic canister-style planter with unique metallic copper finish and debossed diamond texture. Scintillating textured copper finish provides a dazzling accent for small spaces, even when empty. Can be used as a planter or container for pens, pencils, or other small items.